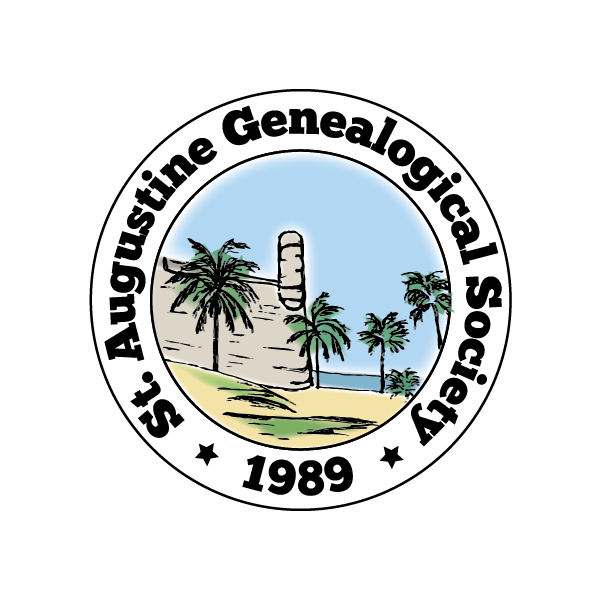 This Privacy Notice explains how information about St. Augustine Genealogical Society visitors is handled in connection with the services provided through WordPress.com. Automattic is the company behind a variety of products and services designed to allow anyone–from bloggers, to small business owners, and enterprises–to create, publish, and manage their own websites. They provide the design, features, and support that makes St. Augustine Genealogical Society possible. Visitors to St. Augustine Genealogical Society can read published content and interact with the site through features such as comments, “likes,” poll/survey responses, and follows. Follower and Subscriber Information: When a visitor signs up to follow or subscribe to the St. Augustine Genealogical Society using WordPress.com, WordPress collects the sign-up information which typically includes an email address. Site Comments: When a visitor leaves a comment at the St. Augustine Genealogical Society,WordPress collects that comment, and other information that the visitor provides along with the comment, such as the visitor’s name and email address. PollDaddy Survey Responses: When a visitor completes a poll, quiz, or other type of survey posted at the St. Augustine Genealogical Society using Polldaddy.com,WordPress collects the visitor’s responses to those surveys, and other information that the survey owner requires for a poll/quiz/survey response, like an e-mail address. Other Information Entered on the Site: WordPress may also collect other information that a visitor enters at the St. Augustine Genealogical Society – such as a contact form submission, a search query, or site registration. Technical Data from a Visitor’s Computer and Etcetera: WordPress.com collects information that web browsers, mobile devices, and servers typically make available about visitors to our site, such as the IP address, browser type, unique device identifiers, language preference, referring site, the date and time of access, operating system, and mobile network information. Visitor Interactions: WordPress.com collects information about a visitor’s interactions with our site, including the “likes” and “ratings” left by visitors. Location Information: We may determine the approximate location of a visitor’s device from the IP address. WordPress.com collects and uses this information to tally how many people visit the St. Augustine Genealogical Society from certain geographic regions. Akismet Commenter Information: WordPress.com collects information about visitors who comment at the St. Augustine Genealogical Society using their Akismet anti-spam service. The information collected typically includes the commenter’s IP address, user agent, referrer, and Site URL along with other information directly provided by the commenter such as their name, username, email address and the comment. Polldaddy Response Information: WordPress.com collects information about visitors who respond to a Polldaddy survey. The information collected typically includes IP address, browser type, operating system, user agent, and the web page last visited. WordPress.com uses information about St. Augustine Genealogical Society visitors in order to provide Services to our Users and their Sites. Our users may use our Services to, for example, create and manage their Site, sell products and services on their Site, flag and fight comments from spammers, and collect information through polls, quizzes and other surveys. Subsidiaries, Employees, and Independent Contractors: WordPress may disclose Site visitor information to our subsidiaries, our employees, and individuals who are our independent contractors that need to know the information in order to help us provide our services to our Users and their Sites, or to process the information on our behalf. We require our subsidiaries, employees, and independent contractors to follow this Privacy Notice for information about visitors that we share with them. Third Party Vendors: WordPress may share Site visitor information with third party vendors who need to know this information in order to provide their services to us. This group includes vendors that help us provide our services to our Users and their Sites. We require vendors to agree to privacy commitments in order to share information with them. Legal Requests: WordPress may disclose Site visitor information in response to a subpoena, court order, or other governmental request. For more information on how we respond to requests for information, please see our Legal Guidelines. To Protect Rights, Property, and Others: WordPress may disclose Site visitor information when we believe in good faith that disclosure is reasonably necessary to protect the property or rights of Automattic, our Users, third parties, or the public at large. For example, if we have a good faith belief that there is an imminent danger of death or serious physical injury, we may disclose information related to the emergency without delay.